Steeped in traditional geometries and symbols of the Micmac people of Eastern Canada and New England, this collection pops in your modern setting of whites neutrals and walnut browns. 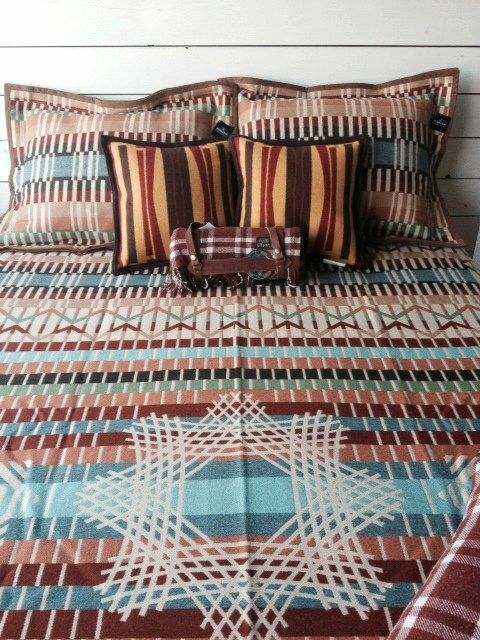 Or gets warm and cozy in your traditional bedroom, with pale blues, oranges, tans and reds. Called the ‘Quill Basket, this soft, natural wool collection is a dance of sharp points and angles, weaving their way together. 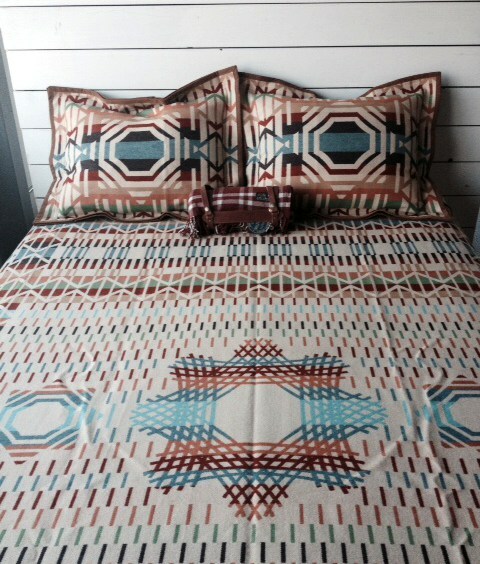 The texture and colors are inspired by porcupine quill handcrafts used up until the mid 1800s. This intricate, traditional embroidery style is translated into Pendleton’s classic jacquard-work, giving the option of two color schemes, just in case you want to mix it up. For the quill blanket, it shows up as a a light, off-white background on one side, and a deep walnut background on the reverse. Here you can see the light side, featuring the petroglyph-inspired starfish as the central element. Also note that the shams feature the geometric pattern on one side and the quill pattern on the other. On the opposite side, the starfish becomes white, punching through the colored background. So, what does your mood call for today? Accenting this collection is the reverse side of the Parfleche Pillow, with deep red, gold and brown to highlight. And the linear patterns flow into the melee, and almost blend, but not quite. And of course, the rolled throw blanket is always handy to have around, in case a cool draft blows in as fall approaches. 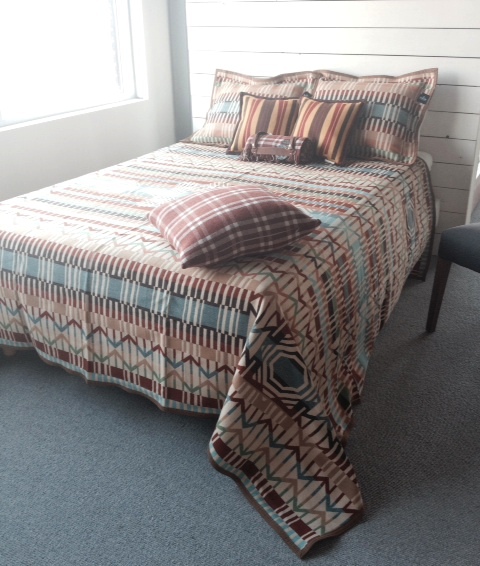 The Pendleton Thomas Kay Weaver’s Plaid is bold and rustic, and the Cedar color goes perfectly with this ensemble. Not to mention that the leather carrier (included) is too cool for school.